Showing 1 - 12 of 12 articles tagged "You're the Worst"
You're the Worst creator: "I hope to be remembered as a show that was structurally and tonally daring without feeling stunt-y"
The FXX comedy returns for its fifth and final season on Jan. Creator Stephen Falk also says there will be one more "Sunday Funday" episode. Creator Stephen Falk’s FXX comedy “is an exploration of debilitating mental illness masquerading as romantic comedy,” says Rachel Syme. Season 4 of the FXX comedy has so far been an unpleasant experience, says Alyssa Rosenberg. Why are so many female comedies described as “raunchy”? The “raunchy” behavior on shows like Broad City, You’re the Worst and The Mick isn’t really that raunchy at all. The two-part season premiere begins with a Jimmy-focused episode. 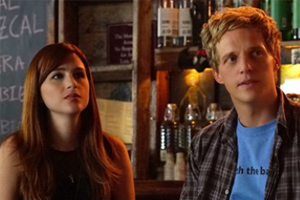 The How I Met Your Mother spinoff will be given another chance with You’re the Worst writer Alison Bennett.